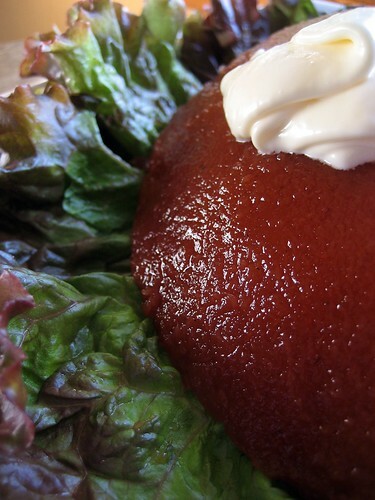 One year Barnaby's mother Mandy made a tomato aspic that was the yummiest thing ever. She served it with Thanksgiving dinner at her home in Palm Springs. We ate outside and the aspic was a perfect side salad to have on a warm evening (it would be great on a cool eve too, for that matter!). The nice thing about aspic is that it's quick and easy to prepare, you can make it in advance so you're not freaking out at the last minute, and no one ever expects to be served this tasty retro dish. Place 1-1/2 cups of cold vegetable juice in a bowl and sprinkle the gelatin over the top. Let stand for 5 minutes so the gelatin softens. Add 2-1/2 cups of vegetable juice to saucepan and heat until hot; remove from heat. Add 1-1/2 cups of tomato/gelatin mixture. Continue heating on medium heat setting and stir mixture until the gelatin dissolves into the juice (about 5 minutes). Pour in the remaining 1 cup of cold juice and lemon juice. Pour into a bowl, mold or individual cups, and chill until firm. Excellent served with avocado and a dollop of mayo. Note: Trader Joe's has a great Bloody Mary mix that makes a wonderful, slightly spicy aspic. Sometimes I will add diced onions, celery, and olive to the mold in order to give the aspic texture. I'm sure your aspic is yummy, but the topic reminds me of a great book called "The Gallery of Regrettable Food". Really fun book to pull out when foodie friends come over. I remember I ate something like this at a party a few years ago, and it was so good! However I never got around to asking who made it or how was it made. Now I can whip this up at home! My vegan friend will love this! Hi Thumbook, just a note....you'll need to find some vegan gelatin for your friend. I'd recommend the kosher gelatin. Sounds like the perfect dish for this time of year when it's cool mornings and warm evenings. I think I will try this for the week end. Thanks for the recipe!!! Never tried this but think it would be just great - very original. Not sure what to eat it with though! Thanks for the tip Barnaby, we'll be having a picnic with friends this weekend and I'll surprise them with this. I already tried it at home and it's amazing! Keep the great food coming! Great to see this getting around and so nicely presented! Add the chopped stuff when the aspic is about 1/2 set. My favorites are finely sliced celery and Kalamata Olives. Capers work too. About what to serve it with -- anything you'd serve tomatos or salad with like hamburers, steak, pork chops, chicken. Well, maybe not pasta!